Last night we had a friend at home for Cheese fondue. 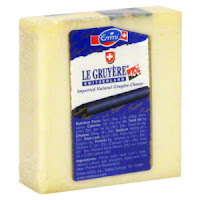 I usually prepare that meal using half-comté, half gruyere and realized at the last minute that we had none of the latter. I drove to the closest grocery store and got a small portion large enough (I thought) to complete the mix. The store offered a bunch of 0.53 lb (240 gr) shrink-wrapped pieces for $9.09 each. Even though it was much more expensive than at Costco, I picked what I needed, went home and proceeded to weigh my cheese on a super precise, electronic scale and found that instead of the 240 grams per piece, I weighted only 180 grams, a hefty 25 percent below the printed weight! Needless to say that I was expecting more precision and integrity from a Swiss company, so much so that I intend to expand my probe to larger pieces of cheese. Next time I'll go to Costco and get the larger pieces we usually purchase, will weigh them and compare with what the packaging says. At that point, we'll see if there's a fraudulent pattern!